Swedish defence firm Saab will cut the price on its Gripen fighter jet to ensure that it wins a Swiss order after French planemaker Dassault threatened to undercut its offer, a report said Wednesday. In November, Dassault lost out on a bid to replace Switzerland's ageing F5 fighter fleet when the Federal Council opted instead to buy 22 Saab Gripen planes for an estimated 3.1 billion francs (2.6 billion euros). "The price will be less than 3.1 billion (francs), Saab's Switzerland director Anders Carp was quoted by the Swiss daily Tages-Anzeiger as saying. Sources cited by the newspaper suggested the new price could be between 2.5 and 2.8 billion francs. It is understood Saab wants to challenge a reported counter-offer by Dassault proposing 18 Rafale planes for 2.7 billion francs. Dassault sent a letter outlining the proposal to the security commission of the Swiss parliament, which still has to approve the Gripen purchase. The Swiss government must formally endorse the deal this month and it will then be sent to lawmakers for final approval later this year. 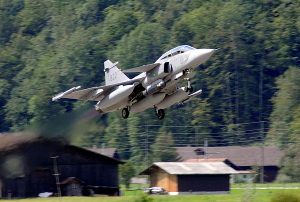 Saab has said Bern can sign the Gripen contract directly with the Swedish government which would act as a guarantor in the event of any difficulty in delivering the aircraft, Hakan Jevrell from the Swedish defence ministry told Tages Anzeiger. Last month, India announced it had selected Dassault as sole bidder to negotiate a sale of 126 Rafales estimated at $12 billion (9.1 billion euros).